1) Drupal doesn’t require any license or doesn’t require to give any royalty. The source code of an application or program created in Drupal is easily accessible. 2) The development time of Drupal is reduced by half because of the rapid and agile performance of Web 2.0 Development. You will find clean codes, content management board, page and blog publishing, polls, forums, user login modules, polls and much more. 3) There are more than 30000+ modules available in the community to help you quickly add specific features to your website for CRM, Performance, Backup Security and more. You can add them very simply and quickly to build your website. 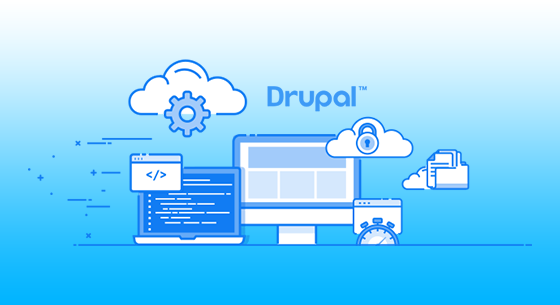 4) When it comes to security Drupal CMS is known for its rock solid security, dependability and security patches and constant updates. Drupal saves you from unknown security threats or any online code exploits by the hackers. 5) You can build from 1 page and develop up to 5000 pages while never expecting to change anything. Execution and security parameters can be managed from the Admin support. 6) A 100% free open source software, you will never get locked down with licenses, recurring fees or anything proprietary or any other bodies. Installing the CMS files on your server is enough and you’re ready. 7) You can easily create and publish the content, setting user roles and permissions, choose who can view/edit/share content. Powerful content creation and collaboration is Drupal’s heart. 8) E-commerce modules and integrating payment gateways is a cherry on the cake with Drupal, thanks to a lot of open APIs and Modules. There are ready made eCommerce distributions available for payment gateways, shopping carts, logistics handling, CRM, messaging and so on. 9) A huge community of theme designers has designed amazing templates that will help you to understand your website’s vision and your needs too. Fonts, responsive layouts, graphics, adjustable color themes, and layout. You can discover whether which image suits your personality or simply build your website. 10) In order to expand your Drupal website, Integrating with the 3rd party administrations and APIs is used. Social networking is widely used to help you involve with a wider range of people. Drupal also allows interacting with external media and file services too. Why Should You Choose Laravel For Your Next Web Project?